In the winter session, you can get up-to-date information by the help of training. The students can take the opportunity in their winter break/leave it is valuable for the Engineering students who are probably looking the best training option to find some to utilize semester break. Most of the student believes that the jobs are possible by the internship, that’s why the lots of training company are providing the winter training for engineering students. 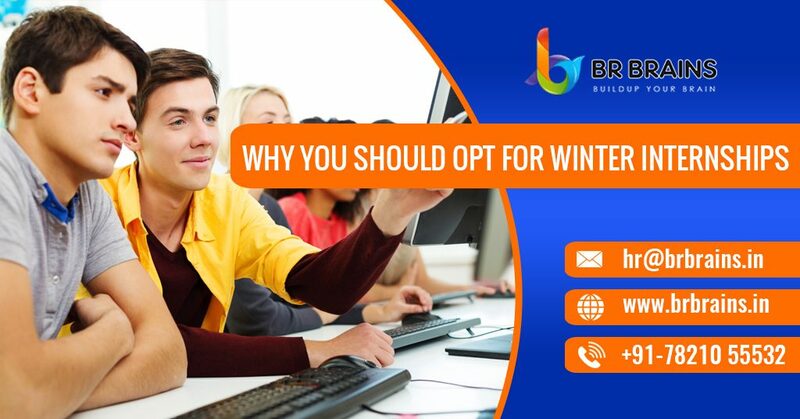 The students know that the “winter internships 2018” is required for all students where they can get the winter training experience in BR Brains Training Company. Apart from this, students get the experience of real-world experience, which is possible only in training companies. Here we are providing you the solution of winter training for engineering students, which is really helpful to build a delightful and bright career in the IT industry. The Student can discover the training opportunity and apply there. We know that the student can confirm the seat in the training company and get the advantage of winter break along with training in several fields. You can just discover the better training company which provides the best environment of learning, personality development, winter training 2018, skill empowerment and many more services. You can reserve your seat in the BR Brains Training Company where you can get this feature to build a smart and professional career. What is a Winter Internship? You can get effective and expert internship in these fields to make a bright career with these internships courses. Here we provide the benefits of winter training for engineering students where they can grab the expertise in several technical industries. Additional Time to Practice: – In the Training company you can get an additional advantage of extra time where you can easily get the working experience to grab the better job by practice knowledge experience based. You can utilize your free time work with practical knowledge in your career field. Also, you can resolve your technical concept with expert developers or mentor to enhance the work appearance. Learn Time Management:- You can learn time management. It is the best and valuable feature of the training company which provides you time management skills. You can easily schedule your task according to time and make the qualitative project in a limited time duration. It is a really effective source where you can increase your working ability. The brochure of technical course increases the technical course ability of job offer. Education Qualification:- We offer the winter internship to all the students such as BCA, MCA, B. Tech M. Tech, BS, MS, etc. To qualify for the internship, you must have any degree from any field. This is paid internships for all students. Conclusion: In this article, we share the advantages of winter internships 2018. If you want to utilize your winter break as a valuable technical training of your life, then you should take a winter internship. We provide the winter training for engineering students in Jaipur at an affordable price in the BR Brains Training Company. After the internship completion, we provide you certified certificate and 100% job placement guarantee in your job dream company. The winter internship experience helps you lot in a various way in your life. If you have any query about internship feel free to contact us BR Brains.